It is very fortunate that tropical marine fish are not sold in the same way that edible forms available from the fishmongers are; priced per pound or kilo. (Although freight costs are an important factor in determining the cost of an imported fish) If this were true then the subject of this issue’s focus would certainly be the most expensive fish per gram we have looked at in this column! 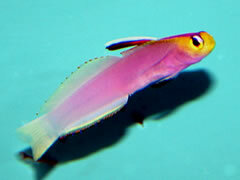 Helfrich’s dart goby, more commonly referred to in the U.K. as Helfrich’s firefish or the lavender firefish, is a shy, diminutive species with several attractive qualities not least the stunning colouration, invertebrate compatibility and laid back attitude to almost any other fish species. The Genus Nemateleotris contains two other species in addition to the aforementioned and both are well known to marine aquarists; indeed they are probably amongst the most commonly kept of all marine fish species. The firefish, N. magnifica, and the Purple firefish, N.decora, are both very similar in terms of their aquarium habits and can be compared with the uncommon and expensive species outlined here. All three species are relatively shy, retreating to the rockwork at the first sign of danger; all achieve a relatively modest size of around 9cm or so (6cm is perhaps more realistic for Helfrich’s firefish) and all are outstandingly gorgeous in colouration and patterning. Often grouped with the gobies the dartfish are actually part of a different, although closely related group called the Microdesmidae. 1. This is a fish with a limited range including some islands in Micronesia, Ryuku and Tuamoto and was only formally described by science in 1973 suggesting that it is hard to find even in its native, and remote, range. 2. Helfrich’s firefish is seldom found in water less than 40m deep. This means that it is effectively at the maximum range of commercial collectors that use standard compressed air tanks for diving. The deeper you go the less “bottom” time you have and therefore the amount of time you can spend searching for this elusive fish is limited. 3. This species is usually encountered singly or in pairs where a hole or burrow is built into the soft sand/gravel or rubble substrate. The other members of the genus can be regularly encountered in groups of several individuals and therefore a collector does not have to work particularly hard to gather a number of specimens. Single specimens take time to locate and capture. We all know that time is money! So what will one of these fish cost in the U.K.? Well, depends upon the source. Direct imports are generally cheaper than those specimens brought in through marine wholesalers but they carry the risk for the dealer of poor shipping (this is rare given that the main “outlet” for Helfrich’s dartfish is Hawaii which sources most of its dartfish from the Marshall Islands) or problems associated with a specimen not feeding. It is much less risky to observe a fish feeding before you buy whether you are a dealer or hobbyist but then that peace of mind is going to cost you! So in order to secure the dartfish of your dreams you are going to have to be prepared to part with at least £100 but perhaps more realistically you could expect to be relieved of £140-£180 by a dealer with one of these beauties in residence. As usual we tend to find that aquarists in the U.S. have things a little better. A brief scan of some sites stateside reveal that $160-180 seems to be the average price range which actually equates quite favourably with the non-wholesaler derived fish. Husbandry of this species is fairly easy provided the aquarium into which it is introduced is peaceful enough. Many marine aquarists will have experienced the phenomenon of their firefish disappearing for days on end and just when they are assuming the worst has happened the little chap suddenly reappears looking a little skinny. Whether this is due to anything more sinister than the fish being bullied by its tankmates is not clear but dartfish are not particularly good at resisting the attentions of more dominant or aggressive species. The general consensus is that active wrasse are not good species to mix with Helfrich’s dartfish and even tangs and surgeons which pay them little attention can be a little too boisterous for this seemingly nervous fish. When settled into a peaceful aquarium this species will be almost permanently on view as it maintains its position in the water column usually facing into the direction of the current. Wild specimens orient themselves in such a way because this is where their planktonic food comes from. In captivity a variety of different foodstuffs will be accepted with brine shrimp, chopped mysis and other small frozen foods being the first that are generally consumed after introduction to the aquarium. Given time and perseverance on the aquarist’s part these fish will accept flaked and granular foods eagerly. Specimens should ideally be fed little and often as this simulates their feeding in the wild. Three times a day for the un-automated or busy aquarist should suffice and preferably with different foodstuffs each time. It is sometimes necessary to build-up specimens that have refused to feed for a period of time and in these cases mysis is usually the best. Some authors recommend the use of live foods to stimulate a feeding response but strictly speaking you shouldn’t have bought a non-feeding fish in the first place so this info is perhaps for dealers or wholesalers only! So should you come across this beautiful little fish in any of your dealers aquaria should you be tempted? Well, far be it from us to spend your money for you but would you think twice about spending money on the more closely related dartfish from this genus? The longer you admire this fish and its behaviour in the aquarium the stronger the feeling that this is simply an “ordinary” firefish but with a more unusual livery. Almost everything else in terms of compatible tankmates, husbandry, diet and other requirements are identical to its close relatives. Of course the main reason more of these fish aren’t kept is their rarity and price but at least if you take the financial plunge you can expect this gem to thrive.